Do you want to make your LinkedIn Company Page stand out? Are you looking for tips to take your LinkedIn Company Page to the next level? If your answer is yes to any one of the above questions, than you are at the right place. I will share with you 35 different ways you can make your LinkedIn Page more engaging for your followers. You might ask why to setup a LinkedIn company page? Following are the most compelling reasons why you should have a LinkedIn Company page. Convinced? Now login to your LinkedIn account and create a nice LinkedIn company page. Once you’ve created a LinkedIn Company page, come back to this page and read following 35 tips to improve your LinkedIn Company Page and apply it. Go and get some more leads for your business. Linked is an ocean with full of business leads. 1. Write your company name exactly how it appears on your business card. 3. Add targeted keywords in the company description. Make sure you use this space wisely and write SEO friendly content. 4. LinkedIn recommends that 20 posts per month can reach 60% of your target audience. I recommend that you should write at least 1 or 2 updates for LinkedIn Company Page. 5. Integrate LinkedIn Company Page Share button on your company website. 6. Create a LinkedIn Group for your products / services. 7. Add Twitter Account with your LinkedIn Company page / Professional Profile. 8. Share YouTube Videos about your company’s products or services on LinkedIn Company Page. 9. Request all your LinkedIn Connections, Partners, Associates, Colleagues and Clients to review those on LinkedIn Company Page. 10. Create a “careers” tab on LinkedIn Company Page and post jobs. Google index it fast when post jobs on LinkedIn. 11. 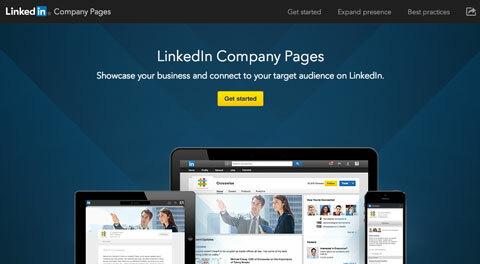 Integrate your company’s blog feed with LinkedIn company page. 12. Check LinkedIn Analytics for your company page regularly. See which content is most engaging and post updates accordingly. Also, find out how many visitors visited your company page. There are lots of meaningful data available. 13. Post Images and Videos more in updates than simply long boring texts. 14. Take interview of the CEO and share it on LinkedIn company page. 15. Please add “Products / Services / Portfolio” to the company page. 16. Choose an appropriate business category. 18. Use LinkedIn Widgets / Plugins – https://developer.linkedin.com/plugins on to your company website and blog. 21. Run LinkedIn Ad. Yes, you read it right. LinkedIn ad is very powerful and can attract targeted audience. Run an ad which can go to either your LinkedIn company page or a landing page. 22. Sponsor your contents / posts. Check LinkedIn Company Page Analytics and see which post / update is the most engaging and promote the same further with sponsor feature. It’s again a paid feature on LinkedIn but very useful. 23. Share client’s testimonials on LinkedIn Company Page. 24. Inform all your colleagues and employees to add your LinkedIn Company Page in their personal profile’s work section. 25. Submit Annual Report / Annual Events on LinkedIn Company Page. 27. Follow 4-1-1 Rule when posting LinkedIn Updates. 4 new contents, 1 reshare and 1 self promotion. 29. Use a third party apps like https://addvocate.com/ or https://gaggleamp.com/ to create more engagement within your staff. 31. Use a tool like Hoosuite to schedule posts on LinkedIn Company Page. 32. Follow your client’s LinkedIn company pages so that they can follow yours. 34. Promote company events on LinkedIn Company Page. 35. Share your press release links in company page updates.